English crumpets, cousin to English muffins, are made in a hot skillet in no time and served with butter and jam. It’s a traditional British breakfast bread that’s served with tea. What, exactly, is a crumpet? We were wondering the same thing. As with English muffins, they contain nooks and crannies galore where butter can catch and create a puddle. Unlike the English muffin, crumpets have craggy parts on only one side and the bread beneath the buttery crags is ever so slightly sweet and inexplicably chewy yet airy. It’s something that’s best experienced. So go on. 1. In a large bowl, combine the water, sugar, and yeast. Let the mixture sit for about 5 minutes, or until foamy. 2. Stir in the flour, salt, baking soda, and milk. Cover and leave in a warm place for about 30 minutes, or until the mixture has risen. 3. Butter a large nonstick skillet and place it over low heat. 4. Generously butter the crumpet rings or 2 1/2-inch biscuit cutters. Place the rings in the skillet and fill each halfway with batter. Cook over low heat for 10 minutes, or until small holes appear and the top of the crumpets have started to dry. Remove the rings, turn the crumpets over, and cook for 1 to 2 minutes, or until lightly browned. Repeat with the remaining batter. 5. 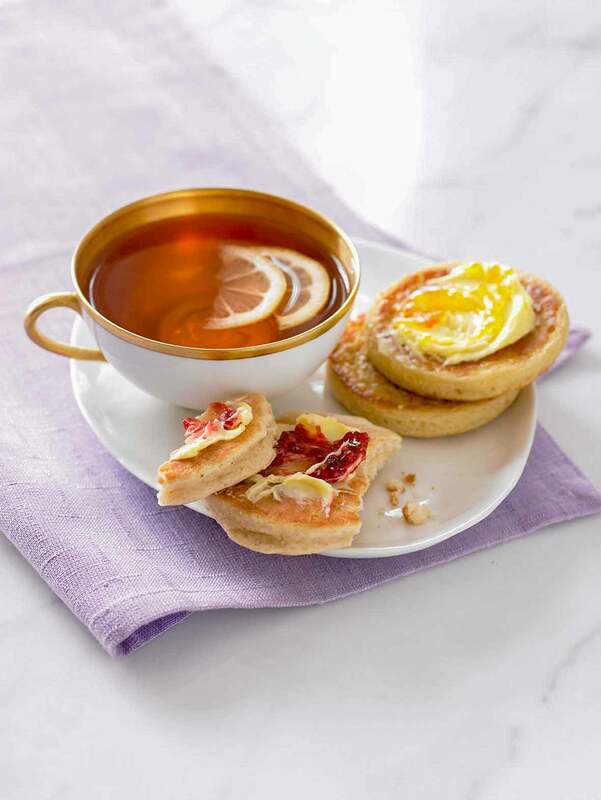 Serve the crumpets warm or toasted with butter and jam. I was shopping for English muffins in the local grocery store and I refused to pay almost $5 for a pack of 6 muffins with somewhat undesirable ingredients. So I figured I would come home and search the LC site and make my own, save $, and choose my ingredients—what a concept! I found this recipe for English crumpets, which is the next best thing to English muffins. I just tasted one hot out of the pan with butter and raspberry jam, and these are AMAZING. They rose quite a bit, so I was able to split one open like an English muffin. It was crisp on the outside and soft, with little nooks and crannies, on the inside. I began making these at 11 p.m. on a Saturday for Sunday morning breakfast and they were ready to eat by midnight. I cannot wait to make a breakfast sandwich with sausage, egg, and cheese with one of these bad boys tomorrow morning! I didn't have any biscuit molds, so I made my own rings out of tin foil. I folded the foil lengthwise over itself into a 2-inch-high piece until it was sturdy, and then folded the two ends together to make a ring and buttered it. This impromptu method worked great. I made these in a buttered cast-iron skillet with ease, no sticking. The taste of these was delicious and worth the effort, which was actually quite minimal. I will make these again, and I will be on the lookout for ring molds next time I'm out shopping. Update: I made these late last night and when served warm they were divine. This morning I toasted one and made a breakfast sandwich with a fried egg, Cheddar, and sausage, and it just happened to be the best breakfast sandwich I have ever eaten. Then I tried a crumpet toasted with butter and jam, and the crumpet was still moist and delicious, even when toasted. This recipe is by far my favorite LC recipe I've made thus far. I have no reason to purchase crumpets or English muffins from a bakery or store ever again. These even beat the local bakery version...by a lot! UPDATE: I’ve made these twice now, and they are divine. The first time I made them, I fashioned the crumpet molds out of aluminum foil and they worked great. After tasting the end result, my mission was to find some proper molds. I picked up some english muffin rings from Sur La Table. This recipe yields 8 muffins when made with the rings. My only suggestion is to use a large bowl when mixing the ingredients because they do rise and the batter overflowed my 4-cup glass measuring cup during the rise. Still, I’m a happy girl and can’t wait to make my Sunday a.m. breakfast sandwich with these tomorrow! I actually split these just like an English muffin. They're great eaten warm or toasted the next day. I don’t know why I had never thought to ; look recipe for English crumpets. This recipe is far better than anything you can buy from the store and is easy to put together—it has a simple procedure and you can easily find all the necessary ingredients in your cupboards. The crumpets had a great spongy texture and were so good out of the pan. I’ll definitely be making these regularly. This recipe was so easy and produced a delicious crumpet. I served them warm with butter and blackberry jam and they were a big hit with my family. My 13-year-old daughter couldn’t get enough. I am so happy I chose this recipe to try. I bake a lot of breads and scones, but have never tried English crumpets. Fabulous! I’d never had English crumpets, but they're such a fun-named bread. These were easy to make and a treat to eat. My family hopes I’ll be making these crumpets often. Yum. The crumpets turned out very well and reminded me of a traditional English tea. Love the texture. Such a lovely breakfast or brunch idea. Am going to make these crumpets again this week for guests. I have never had REAL English crumpets, so I am not sure how true these are, but they were delicious and super easy to make. These crumpets were wonderful. They were beautiful inside—nice little air pockets—and are perfect split open and spread with butter and jam. They were also simple to prepare. It was hard to believe I had the first batch of these on the table about an hour after starting them. These English crumpets were very simple to put together. They baked up exactly as I imagined they should, even though my rings (who has crumpet rings?) were from mini tart pans and a little bigger than indicated. I found it easier to turn the crumpets before removing the rings, but maybe that’s because mine were a bit too large. The finished crumpet was delicious just split opened and buttered, even better when toasted. Crumpets remind me of a cross between pancakes and biscuits. Served along side butter and apricot-peach jam, they were both comforting and filling. Can’t wait to serve them at my next breakfast engagement! This is a recipe worth raising a pinky over. The crumpets are easy to make and only require patience as you wait for the little bubbles to form in the batter. They will be making regular appearances at weekend breakfasts. This was a very straightforward crumpet recipe with yummy results. Although I initially worried if the altitude at which we live (6700 feet) would affect the outcome, the crumpet batter rose just perfectly and cooked per the recipe directions. The warm crumpets were tasty and the leftovers were toasted for the next day’s breakfast and were just as delicious-warm with butter or of course smothered with jam. It’s hard to find a good yeast bread recipe that works. Not only does this one work (rising and cooking times) but it turns out a tasty product. “Low” heat is a little subjective—just watch your first batch and adjust the flame depending on how cooked the crumpets are after 10 minutes. And definitely butter those rings! Then, split with a fork, toast one up, and slather it generously with butter. So good! These crumpets are fantastic hot out of the pan with a little bit of butter. They are very easy to make, too. 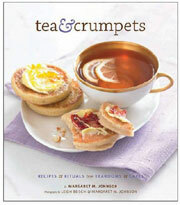 English Crumpets Recipe © 2009 Margaret M. Johnson. Photo © 2009 Leigh Beisch. All rights reserved. All recipes and photos used with permission of the publisher.